After painting with Bob Ross in my last post (see Painting With Bob Ross), I decided to try these newly acquired tricks on my own. I had just watched him do a painting on a black canvas and thought it would be really cool to try it out. Of course, being stingy me, I used a white canvas. I just painted it black. Also, I used acrylic paint again so it didn’t have the same effect as Mr. Bob Ross’ oil painting did. Rather than a luminous glow, I got a wash of colour… I was expecting it, but hoping otherwise. I spent a good 30 minutes if not more on painting the sky. I was trying to get a glowing moon and cloud depth. Overall, I think I did a decent job and I am really happy with the sky. Maybe I like it more because I ended covering up 65% of it with trees, but hey, I think helps with the depth! The trees in the background actually started out as bushes, but as I painted in the valley and the large foreground trees, the bushes turned into far away trees with brush underneath. I then added little trunks to cement the illusion. I, once again, am very pleased. Acrylic painting on canvas of trees after a summer’s snowfall. Cyan, black, and white. Even with that small mistake, I really like this picture. 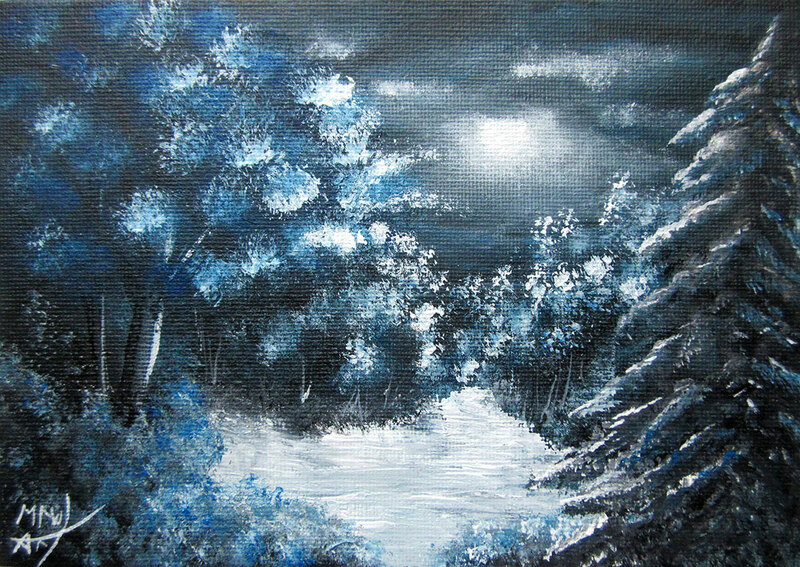 I would like to thank Bob Ross for making that TV series so I could learn a few tips and tricks when painting nature!